Ever Wondered What Those Two Holes On Your Converse Are For? Converse shoes have pop in terms of popularity from a few years now. And the idea behind this is very simple, they look classy and are comparatively cheap and one can easily afford them. No doubts, they are everyone's choice, be it a college student or a movie star. But have you observed it well yet? There are two random holes on the side of your converse. Do you know what's that for? To find out why, read out the whole story. Share this with your friends! We all know how trending converse shoes are. But have you observed it well enough? Ever imagined what is the use of those two random holes on the side of the shoes? A lot of people wear it but still don't know the reason. We will reveal the reason! We all are familiar with this type of lacing. Mainstream business! The trick is to ensure that your laces are tied very tightly so that shoe fits perfect. 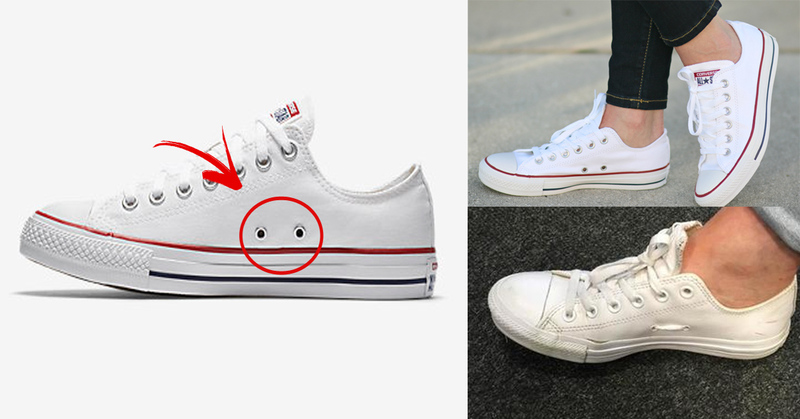 So, this is why these random holes are placed there in your converse. Here's how you do it. Begin by removing the laces in the first two holes of your shoe, after that lace them in bottom holes before putting the lace in your second to the last hole. And we are done here!